I haven't been too well for a while, and I've been at home a lot. Here are the fruits of all that time off. I'm thinking of opening a shop on Folksy. It's so much fun designing and making things that I might as well make them to sell. You like? 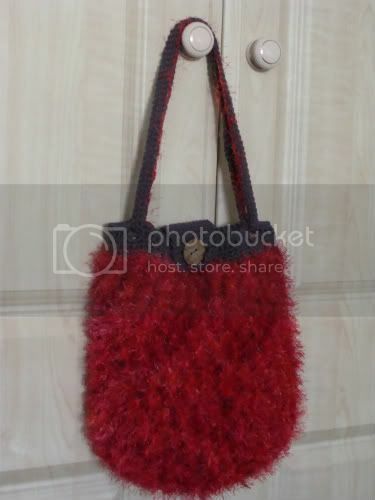 Do you think these are the kind of things that would sell? Any advice? I'm interested in all opinions. They're all so good! I love Gracie the Elephant especially! Thank you very much! 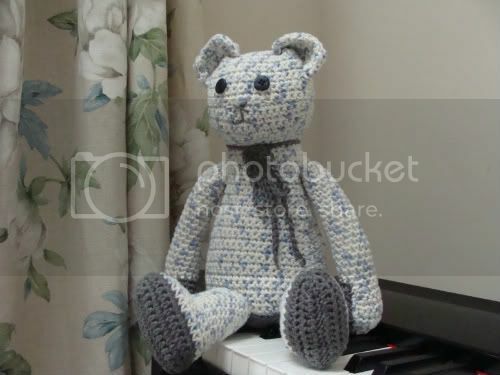 I may sell Gracie on eBay, rather than Folksy, because I made her from someone else's pattern. *has been reading copyright rules* I'll put the link up here if I do. I'll keep watching! I've only ever crocheted blanket squares, so it's fascinating to see what can be accomplished with yarn and hook. I'm mainly a knitter, when I have the time. Thank you! I'll put the links up here when I get the shop sorted. Gracie may well go on eBay, though, because it's not a pattern I designed myself. Mustn't upset the copyright people! Not doing great. I think the medication I was on opened the door for the chest infection, and now I'm coming off it, I can't sleep. I'm very grrrrr! Thank you! It's not really difficult, but then I have been doing this kind of thing since I was a kid. I just love the colours and the feel of yarn. They're great! I love the hats and scarf and the bear is adorable. Thank you! I was kind of worried about the bear's face. Too sad? Wonky eyes? It's really hard to get the expression right on a bear's face! You do beautiful work, I particularly like the teddy and elephant but the hat and scarf duo are lovely too--as is everything. Thank you! I'm investigating the possibility of selling. Like you say - it can't hurt to try. This is really hard, because I love them all, but I'd dearly love that violet cream set. Thank you! 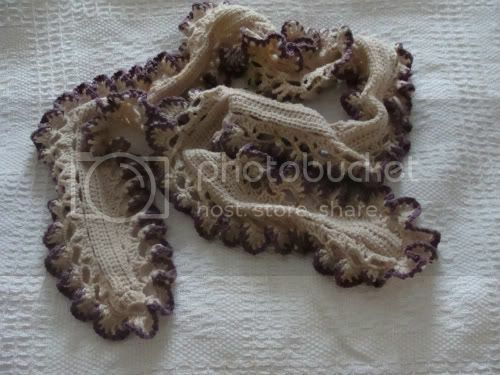 That might be going on eBay, because the scarf's made from a pattern in a book. Against Folksy's copyright rules, you see. I'll put the links up here when it's all sorted, in case anyone's interested. Thank you! I'm quite attached to her. Shame it's someone else's pattern - I could happily make a whole troop of those to sell. Thank you! 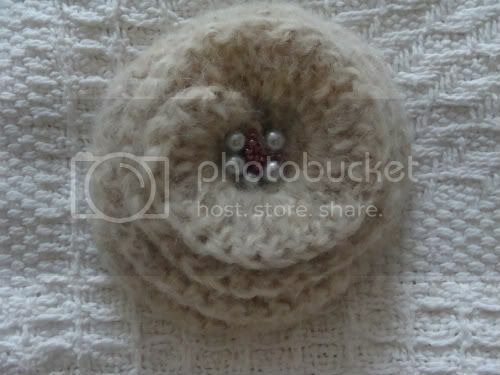 I'm looking at getting a shop on Folksy.com, because that's all UK-based. 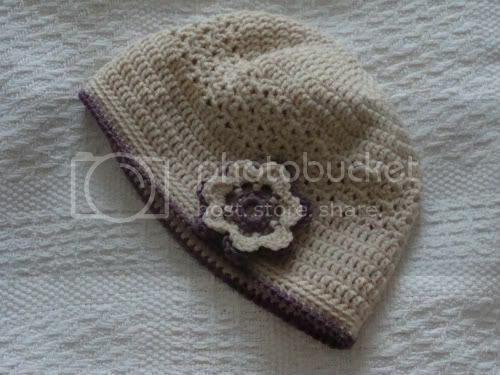 The Bramble Pie hat is my own design so that could go on there, but the Violet Cream scarf is out of a book, so I might put that set on eBay. I'll put links up here when it's sorted, in case anyone's interested. Thank you! I'll put links up here when it's all sorted. I love the hats! I don't know what the difference between the deals for selling at folksy are as opposed to etsy...but I'd check both. Thank you! I'm leaning towards Folksy, because it's UK-based. I'll put the links up here when I've got it all sorted. 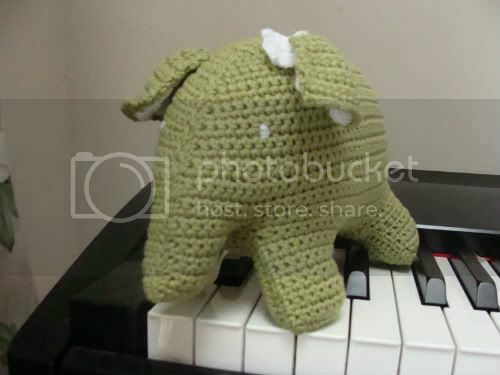 I really, really want to make that elephant. Where did you find the pattern? Also, is there a pattern for the edging on the scarf? It's delicious. Thank you! I've checked, and I got Gracie's pattern out of a Woman's Weekly craft special, but they got it from Lucinda Guy's Crochet Designs for Girls and Boys. It's adorable! And the scarf came from Cute and Easy Crochet by Nikki Trench. I'm glad you like it! Amazing work!! I don't know Folksy but have you heard of Etsy? I'm sure your things would sell and if you design your own patterns, you can sell those too! I would absolutely love to learn how to make the elephant and the hat and scarf set. I've looked at both sites, and I'm leaning towards Folksy because it's UK-based. Both Gracie and the scarf came from books - Lucinda Guy's Crochet Designs for Girls and Boys and Cute and Easy Crochet by Nikki Trench. 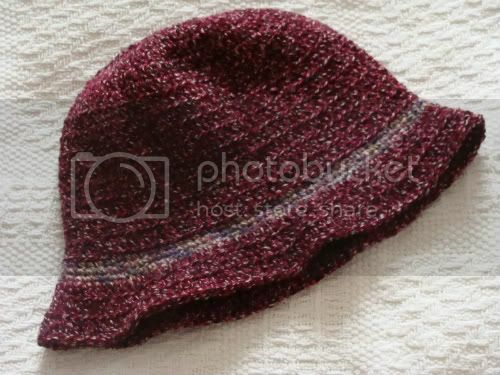 The hat's a mish-mash of several stitches and patterns, so I guess that qualifies as my own design!